The Community Round Table requested funding from the Ontario Trillium Foundation to move forward on the strategic directions that were identified at the 2010 Community Summit - Developing Future Directions for Sarnia-Lambton. The Round Table proposed using the funding to enhance Sarnia as a sustainable community, to build a strong, positive image of the community, to attract, retain and engage youth, and to foster community inclusion, collaboration and engagement. The funding was requested to create the infrastructure to make the initiatives self-sustaining. They recognized that the work would require continual nurturing, and the Community Round Table committed to working with its partners to ensure that this happens. As part of the Trillium project, these two events were held in 2012: Aguas Azul – Celebrate Sarnia and Neighbourhood Meet and Greets. Other projects such as Dear Sarnia and Community Conversations have also been launched. In the summer of 2012, the Community Round Table hosted “Aguas Azul – Celebrate Sarnia.” Members of the community were invited to Centennial Park on May 26, 2012 to celebrate the city. The day included food and drinks, presentations from residents on positive community experiences and discussions about further community engagement. The event was facilitated by Paul Born, director of Tamarack, an Institute for Community Engagement. For more information on Paul Born’s work, please visit the Tamarack website. The Community Round Table organized a series of Neighbourhood Meet and Greets in neighbourhoods around Sarnia with help from the Ontario Trillium Foundation. The Community Round Table invited neighbors to hold barbecues, street parties, community cleanups, community games or anything that brings people in their neighbourhood closer together. They emphasized the numerous benefits of neighbourhood engagement, including meeting your neighbours and making new friends, increasing the sense of belonging to a community, encouraging neighbours to look after each other and the neighbourhood, and having fun! Individuals were also invited to submit applications to win host kits for this event. These kits included burgers, sausages, sweets, and for a few lucky neighbourhoods games, live music performances and face-painting. A total of twelve kits were distributed to those that submitted winning entries, but several neighbourhoods who did not receive host kits held Meet and Greets as well. The Neighbourhood Meet and Greets occurred on the weekends between September 9 and September 23, 2012. To view pictures from the Meet and Greets, please visit the Community Round Table page on Facebook. They are BACK for 2015! 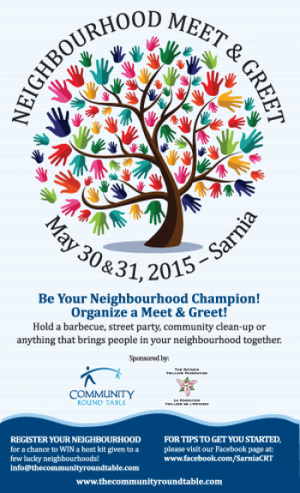 The Neighbourhood Meet and Greets will be held May 30 & 31, 2015. Keep an eye on our website and Facebook page for details on how you can participate with your neighbourhood this year! Dear Sarnia is modeled on the concept of Dear Photograph. Citizens are encouraged to share their memories of the community. This is accomplished by taking a new picture of an old picture, held up in front of the same location today, with a caption outlining what the memory means to you. Visit the photo section on our facebook page to view the current submissions. Richard’s Stanley Cup ring, Trudeau’s paddle, wood from the Golden Spruce and much more. The newest piece has many over the moon! Sarnia’s own Chris Hadfield’s Mission Patch (curiously, guitar-pick-shaped) is installed in the case. To learn more about the guitar, please visit: www.sixstringnation.com. Sarnia’s finest guitarists took the opportunity to strum the iconic strings, including Mark Potvin, Jim Chevalier, Brenden E. Fraser, Dave Miner, Adam Miner, James McNaule, Jeff Getty, Dan Butts, Kevin Churchill, Sarah Jane, Dave & Renee, Mike McKyes, Melle Dacunha, Trevor Bouck, Aaron Zimmer and Keith and Ryan Young. Many other citizens also had the opportunity to hold this incredible piece of Canadiana. Click here to see the photos from the visit to the Bookkeeper and please take a few minutes to read Jowi’s blog, which covers his his visit to Sarnia. Click on any of the following links to be taking to that blog page: Sarnia at Last, School Spirit, Book Keeper, Paddy Flaherty’s, Mayor Mike Bradley, Strangway Centre, First Friday, Cheeky Monkey, DNA Studio. support and humanity. My second family. and venues available to support live music here. Very unique indeed. %u25A0 My favourite story is of the first day we arrived – hot and humid. What are your stories of our community? For more information on the Ontario Trillium Foundation, please visit the Trillium website.